Call us Crazy Canucks but in BC we embrace winter and look forward to all the wonderful activities that our winter climate affords. BC is a winter outdoor playground with a large variety of activities including world class Downhill and Cross Country Skiing, Snowboarding, Ice Climbing, Dog Sledding, Snowmobiling and Storm watching. 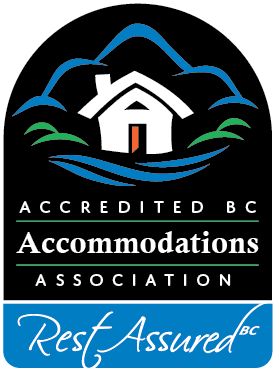 Stay with an Accredited BC Accommodations member and play in our winter wonderland. We have hot chocolate and hot apple cider availabe after a day of winter activities. Our area is great for snowshoeing, cross-country skiing and hiking. The Paulson Cross-country ski trails are just 25 minutes east from us, great groomed tracks and warming huts, take a bagged lunch.Red Mountain is just east 45 minutes in Rossland. Phoenix Mountain is west 45 minutes. Nature graces us with eagles, ravens, and occasionally a lynx and wolf. The Auberge is within a 15 minute drive to the world class Kicking Horse Mountain resort. The resort offers 127 trails and over 4000 vertical feet! Eagle's Eye restaurant offers the highest fine dining experience in Canada at 7700 ft! The resort also offers a wonderful nordic center which offers 50km of cross country trails groomed for classic and skate skiers. For more information, please visit www.kickinghorsemountainresort.com We look forward to welcoming you at the Auberge this winter. Looking to avoid the 2010 Winter Olympics? Want to miss out on the traffic and mayhem? Why not visit Victoria and enjoy real "Off Season" rates in a town not taken over by the games. Settle into a comnfgy chair by the fire and watch the events on a big screen at Abbeymoore Manor Bed & Breakfast Inn in Victoria!